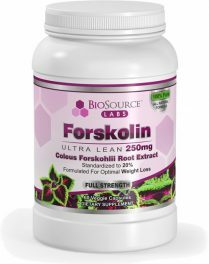 Forskolin is an extract from the plant coleus forskohlii, a member of the mint family native to subtropical regions of Africa and Asia. Coleus has a long history of use in ancient Ayurveda medicine. It has been used to support heart, lung and sexual health, among numerous other uses. Like all herbs, coleus contains a multitude of active compounds. However, the roots of the plant contain its most potent active ingredient, forskolin, which is largely believed to be the most beneficial substance derived from the plant. It has been used extensively in experimental clinical research as a positive control to effectively increase the levels of the important cellular messenger compound cAMP (cyclic adenosine monophosphate). In our body, cyclic AMP helps our cells communicate. An increase or decrease in cAMP is a signal that causes the body to take action. As a suppliment, forskolin is used to support fat burning and energy levels, but has also been proven to be an effective natural testosterone booster. One of the most rigorous and promising studies concerning supplemental forskolin was conducted by researchers at the University of Kansas a few years ago. They found that overweight and obese men lost more than 7.8 times more body fat, added 35 percent more bone mass, and increased their bioavailable free testosterone by almost 34 percent more when they added 250 mg of a 10 percent forskolin-containing coleus to their otherwise unchanged daily lives, twice per day. In other words, 50 mg of total forskolin per day—as compared to subjects who consumed a placebo—realized a significant improvement in both body composition and testosterone levels. Alasbahi RH, Melzig MF. Plectranthus barbatus: a review of phytochemistry, ethnobotanical uses and pharmacology – Part 1. Planta Med. 2010 May;76(7):653-61. Alasbahi RH, Melzig MF. Forskolin and derivatives as tools for studying the role of cAMP. Pharmazie. 2012 Jan;67(1):5-13. Godard MP, et al. Body composition and hormonal adaptations associated with forskolin consumption in overweight and obese men. Obes Res. 2005 Aug;13(8):1335-43.